Putting a Quality Management System in place is one thing, but enforcing the correct use of it is a whole different story. The challenge is to make the registration and follow-up of any type of event as easy as possible for any employee. We call them Event Types but basically these are your non-conformities, deviations, complaints, etc. You can create as many event types as necessary. For each type of event you can also preconfigure some things like the ID prefix events should get automatically, which impact levels are relevant and which QA team will need to follow up. You can also configure if you would receive email notifications for all status, or if you would like to skip a few. If we want employees to log events at all times, we need to make it easy for them. That’s why the event registration form has been kept complete and compliant, but simple. Registering an event shouldn't take more than a minute. Keeping track of which products, projects, services, clients, vendors, etc. are causing the most events is fundamental. Knowing this will give you specific clues about which parts of the company (or which external stakeholders) are failing to keep up with your quality standards. In the QualityKick Events module you can link events to almost anything. This enables you to gain the necessary insights on the long term. 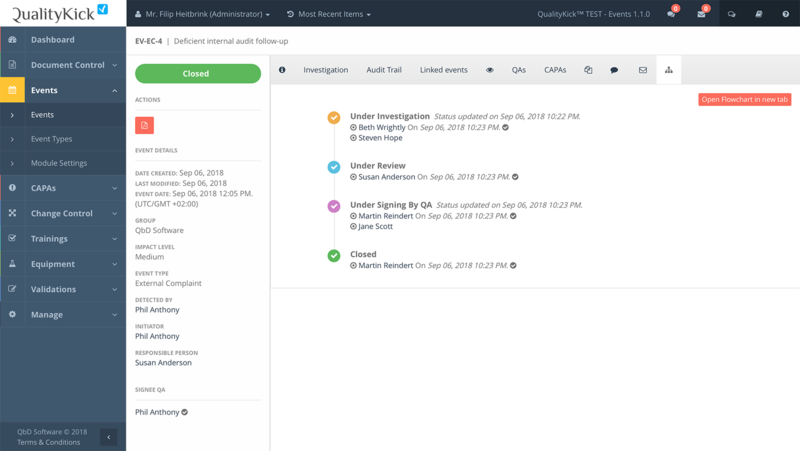 QualityKick’s Events module supports file uploads across the board. This way proof can be uploaded during the event registration or while performing root cause analysis and impact assessment during the event investigation phase. You can upload multiple files and on the Event Detail page there’s a Files section where you can find all uploaded files neatly listed for your convenience. Once an event is created it goes into the investigation phase, in which the appointed investigators gather information performing root cause analysis and impact assessment. After the investigation phase, review is required by the responsible person first and by QA after. During these phases you will typically decide if a CAPA is required or not, after which the event can be closed. If a CAPA is required, the event can be linked to it, to maintain full traceability in the application. But you can learn more about this in the CAPAs module. Obtain incremental quality improvement in all area’s of the company by logging events and acting accordingly upon them. Know exactly where quality standards are not met. QualityKick is a web-based solution which can be used on any device, so there’s no excuse for employees to not log events. 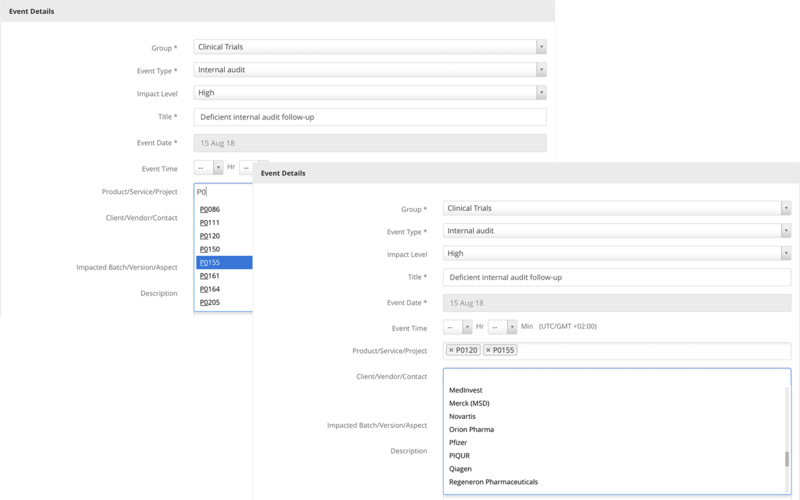 Configuring your Events module for first use is very easy. We will do that together with you while we explain the different configuration options. Your annual QualityKick cost depends both on the amount of modules you use and the amount of users you create. But you can further keep costs down by activating the Events module only for the relevant users who are actually entitled to log events. The events module, in combination with the CAPAs module, enabled HistoGeneX to automate largely the management and follow-up of our deviations, complaints, non-conformities and related CAPAs. BELAC recently audited us and they were quite impressed with our QualityKick implementation. Working in a QMS is obviously not my main task. So for me, the low learning curve and the ease of which I can register an event are very important. Since we use QualityKick for this, the amount of events has increased, so my guess is that before, many events were simply ignored. Additionally, the dashboard page gives me a great overview of the items I have to follow-up on, so I can just get it over with quickly. Creating a centralized quality documentation system is a challenging brief for any organization. 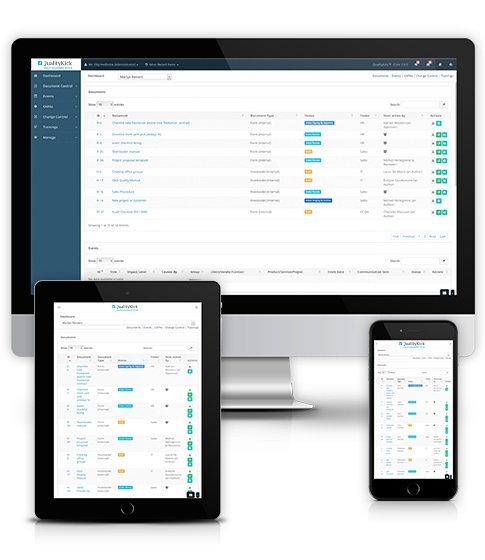 The QualityKick team did a great job of assessing our need and working with different stakeholders to deliver a clear, well-organized and intuitive interface for Events and CAPA management. Once delivered, they are committed to continued development to tailor the application to our needs. What do you consider an “event"? An event is anything which happens in a company or institution which needs to be registered. For example deviations, non-conformities, internal or external complaints, etc. are different types of events in QualityKick. Which event types does the Events module support? You can create as many event types as you wish. Typically you would create for example Deviation, Non-conformity, External complaint, Internal complaint, etc. Then, when a user creates a new event and selects an event type, the form is already pre-populated with relevant data, to make event registration as fast as possible. What is a typical Event workflow in QualityKick? Once an event is registered it immediately gets the Under Investigation status. People which are assigned as Investigators can then gather information by doing root cause analysis and impact assessment. When investigators are done, the event responsible and QA need to sign off on it in order to close the event. During this workflow, if at any moment a CAPA seems to be appropriate, this can be created directly from the event’s detail page to link it automatically to the event in question. All users can create events except for the Read-Only types of users. Can I link an event to some other event which might have occurred in the past? Yes, you can link events to each other. But because not all companies found this useful, you can activate/deactivate this feature in the module settings page of the Events module. Can I upload files to an event? 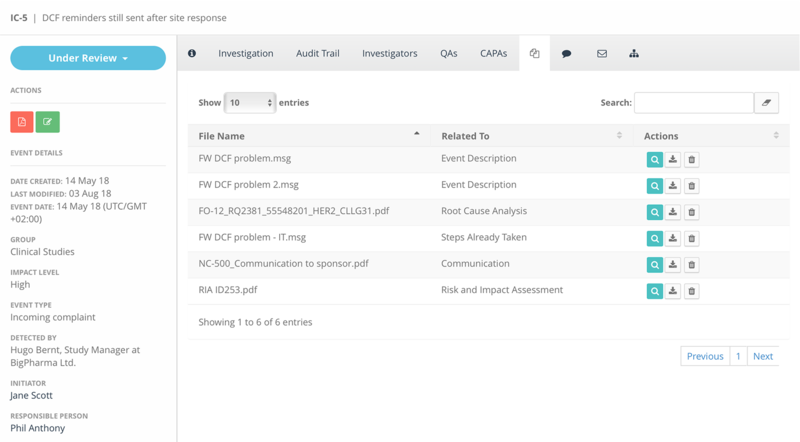 You can upload files to many of the event fields during registration of the event, like the Steps Already Taken field, or during event investigation, like the root cause analysis and impact assessment fields. Because file upload is supported throughout the event workflow, you can find a convenient list of all uploaded files on the Event Detail page, with an indication where the file was uploaded. Can I reopen a closed event? No, you can’t. Once an event is signed off and closed it cannot be reopened. In this case we suggest to register a new event and link it to this closed event for traceability purposes.